Factoid # 41. In the early 1800s the inhabitants of Richmond suffered what we might consider a normal range of ailments including: respiratory, gastrointestinal and rheumatic. These were augmented by headaches and dental problems and more life threatening diseases such as cholera and malaria. With no hospitals and few doctors, the settlers were left to their own devices. Traditional home remedies were the norm but for those with money there were other options. Chief among those were various spices and in particular Allspice. Other remedies included some still known to us today: castor oil, Epsom salts, honey, liquorice root, smelling salts and chamomile. As the century progressed, patent medicine became more common. 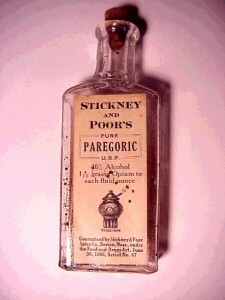 One, paregoric, was advertised as a cure for diarrhea in both adults and children, cough medicine, and as a relaxant for fretting or teething children. Although not all manufacturers used the same recipe here is one from the 1870s, which used both opium and alcohol! A very bad cold might require Syrup of Squills made from a combination of the bulb of the sea onion plant, paregoric (described above) and laudanum (a stronger opiate). Factoid #42: By 1840, the Richmond Road from Bytown to Perth was still by no means a pleasurable drive. In that year, the Anglican Bishop described it “24 miles in a very strong wagon, rough stony roads”. With the gradual development of the timber stands on the rivers flowing into the Ottawa River and along that river in the area around Arnprior, a whole new route became important. The shanties and timber barons needed supplies and the easiest way to get them was overland from Prescott. This new route, which ran through Kemptville, to Richmond and then north to Arnprior was considered better than many other roads. In 1838 the Rev. Thomas Wilson of Perth travelled from Arnprior to North Gower. In his account he mentioned the “excellent” road from Huntley to Richmond. ( this is unlike the scathing criticism he leveled at the roads in other townships) This road helped stop Richmond’s decline and turned it from being a farm center to a service center for hundreds of wagons traveling up the valley. New taverns and hotels appeared and the number of tradesmen: wagon makers, blacksmiths and shoemakers multiplied. Richmond entered a mini boom that was to last until the development of canals and railways made the road redundant. 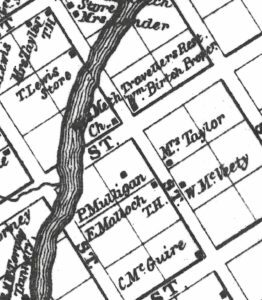 As the traffic increased along McBean St. a number of new buildings were constructed in the block south of the Jock River and on its north shore. Although this map is from 1863, it shows the location of some buildings constructed in the 1840s. Some of these are the first buildings in the village which are still standing. To the south, on the east side of McBean were located Maria Hill Taylor’s new hotel as well as the Travellers’ Rest of William Birtch. On the west side were several houses including that of Constantine McGuire and the Wesleyan Methodist Chapel. North of the River on the east side of McBean was the new stone store of William Lyon, son of Captain George Lyon. Finally! We have some village landmarks that we can still see! When we last saw Maria Hill it was the 1820s. 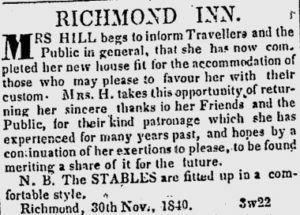 She had acted as hostess to a Duke, officers and the settlement’s soldiers and settlers in the Richmond Arms Hotel. For Maria, sadness entered her life in 1830 with the death of her husband, Andrew. By 1840 her life had taken a new turn. She had a second husband, Andrew Taylor, and a new home and hotel on McBean St. south of the Jock Bridge. This house was a 2 storey wood frame building on the south east corner of the intersection with (Royal) York St. ( lot 13) As travelers entered the village from North Gower and points south, this was the first hotel they encountered. It is interesting that in her advertisement she calls herself Mrs. Hill. Meanwhile her husband acquired many lots along McBean, Murray and Cockburn Streets and farmed. Maria Hill Taylor owned this house until 1879. The building no longer exists. The only remnant of Maria Hill Taylor’s second house/hotel is the smokehouse, which would have provided cured ham and bacon for her guests. These small buildings were usually placed close to the house. We don’t know how Maria Hill cured her meat but it would have approximated either a dry or wet cure. Pigs were usually butchered in the fall when the weather was cool. In a wet cure the meat was placed in a brine of salt, saltpeter and water (some sugar may have been added). With a dry cure a mixture of salt, sugar and saltpeter was applied to a depth of about 1/8th inch on the surface of the meat. The meat was cured for 3-4 days per pound up to about 6 weeks. After being washed, it was dried for several days, and then hung in the smokehouse. In the centre of the house was a pit that contained a bed of smoldering ashes or small fire. The preferred wood was either hickory or maple shavings as they provided the best flavor. Shavings would create smoke but not enough heat to cook the meat. It was smoked for around two weeks and then the bacon or ham was ready for immediate consumption (cooking) or could be stored for a period of time. 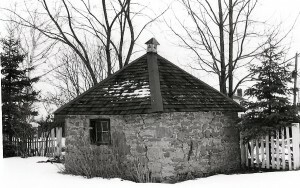 Although smokehouses could be made of wood, this one was made of stone and as usual was roughly square with a steep roof. The pit was probably dug in the earth in the centre of the floor directly under the vent. The smokehouse can still be seen; it sits at the back corner of the house on the east side of McBean St. (3607) just south of the Jock River Bridge. The smokehouse has long been a Richmond landmark. This entry was posted in industry, Locations, merchandise, Personalities. Bookmark the permalink.